In this study, a model based on multivariate autoregressive forecast of seismicity (MARFS) algorithm is adopted to forecast seismic activity rates in northwest Himalaya, using the compiled homogenized moment magnitude (MW) based catalogue. For this purpose, each source zone delineated by Yadav et al. 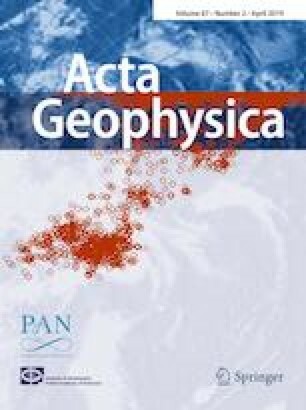 (Pure Appl Geophys 170:283–295, 2012) is divided into a spatial grid interval of 0.5° × 0.5° while the entire catalogue span (1975–2010) is segregated into six time periods/grids to estimate seismic activity rates spatially and temporally. These seismic activity rates which are estimated from spatial density map of hypocenters exhibit high values in Chaman Fault (Zone 1), Hindukush-Pamir region (Zone 3) and the mega thrust systems, i.e., Main Central Thrust, Main Boundary Thrust and Himalayan Frontal Thrust (Zone 4). Then, the seismic activity rates during 2011–2016 could be forecasted by extrapolating (through auto-regression procedure) those observed for previous time periods. The forecast seismic activity rates are estimated within the values of 0 and 7.57 with high values primarily observed in Hindukush-Pamir region of Zone 3 and the gently north-dipping thrust fault systems (Main Central Thrust, Main Boundary Thrust, Himalayan Frontal Thrust) of Zone 4. Finally, the associated area under the curve of receiver operating characteristics graph suggests the superiority of forecasting model with respect to random prediction, whereas results of the data-consistency test, i.e., N test of our model, exhibit consistency in between the observed and simulated likelihoods. Moreover, the hypothetical t test performed in between the spatial grids of forecast seismic activity rates and observed seismic activity rates confirms that the former is consistent with the latter. The authors are thankful to Dr. V. K. Gahlaut, director, National Center for Seismology (NCS), for constant support and encouragement. We are grateful to anonymous reviewers for their detailed comments that tremendously helped to improve the manuscript. Some of the figures were plotted with the Generic Mapping Tools (Wessel and Smith 1998).